I'm not sure why I thought they weren't going to resurrect the Spartan Village name after they replaced it with University Village, but it appears that a new iteration of Spartan Village is going at the corner of Harrison and Kalamazoo, and will include University Village. 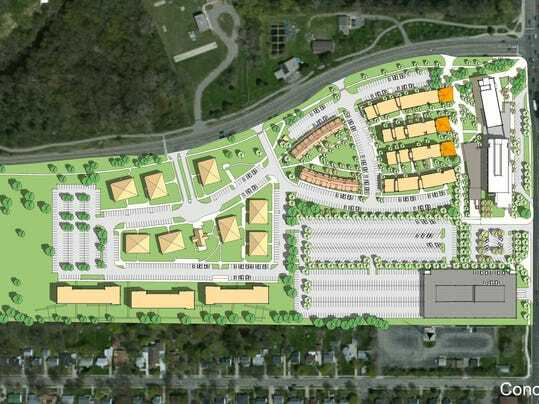 EAST LANSING – A planned housing development across from the Breslin Center would frame the area and act as a gateway to MSU from the south, officials say. Plans are moving forward for the new Spartan Village, an estimated $150 million project. But it still needs final approval to be built on a parking lot at the corner of Harrison Road and Kalamazoo Street in time for Fall classes in 2017. New construction will comprise 10 acres. The eight-year-old University Village complex and land to the west of the property will be included for a total 40 acres of development. Kathy Collins, MSU director of Residence Education and Housing Services, said project details could change before a scheduled presentation to the MSU Board of Trustees for final approval in June. Plans include a 450,000 square foot apartment complex, 105,000 square foot office building for RHS, a community garden, town homes and plenty of open space in the back, she said. It will also have 1,800 parking spaces. Including the nearby University Village, 1,200 beds will be exclusively for students. That's a decrease to 900 new beds to replace the current 120-acre Spartan Village, which serves around 1,000 students. It appears they are going to slowly phase out Spartan Village, which they said is still very popular. 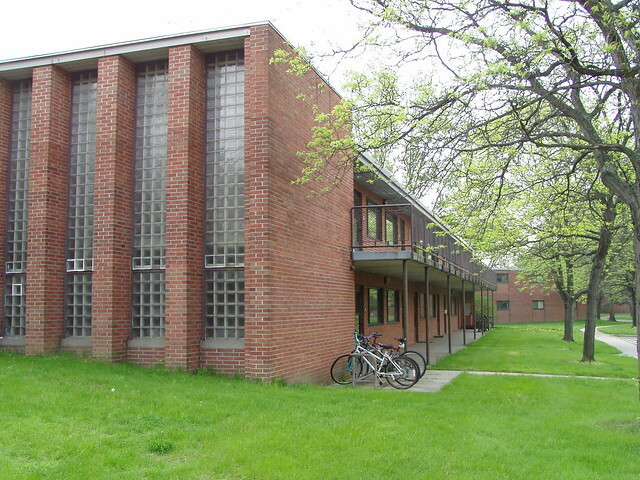 It's weird, but I'm going to miss all of that mid-century stuff in Spartan Village and the like. It's like, they weren't anything special at the time, but they still had more character than the vinyl-sided crap they put up, these days. This should be great. Given it's being done by MSU, I'm sure the architecture and quality of materials will be decent at worst, I just wonder how tall the buildings will be. I really wish that they would get rid of the parking lot fronting Kalamazoo and put it behind or under the buildings though. Regardless, I'm sure it will be a great project that will really help fill in that area and make visiting Breslin Center a little more impressive. I mean, I wouldn't say MSU doing it is a sure sign of quality. They did do University Village, after all, which could be any stereotypical apartment complex in the Northern Tier, really. Yeah, University Village isn't great, but it still used quality materials. Almost all the apartments in the northern tier are a significant step down in quality, they're just the same type of buildings. I would be disappointed if they built anything else resembling University Village though. The project timeline has construction starting on phase 1 in September/October of 2015 and phase 2 starting in June 2016. The full project should be complete by August 2017. More details can be found in the Construction Junction from May 14th. My only major issue with this project is the parking lot between the apartments and Kalamazoo, although it'd of been nice if they opted for a layout more resembling a street grid also. The renderings of the office buildings included in the construction junction actually look really nice, as do the outdoor areas, while the design of the apartments and townhouses seems just adequate. All in all it looks pretty good though. Yeah, I'm disappointed by the large surface lot and the parking right up next to the residential buildings. I would prefer that the parking ramp have one or two more floors added and all surface parking removed. I think the location is close enough to campus that students would accept parking in a garage versus in front of their building just so that they don't have to use their car as often. Yeah even a setup like Hannah Lofts wouldn't be bad, just with a nicer facade. Anyways, I won't complain too much. This project will be adding quite a bit of density to a pretty large, long underused piece of land and doing it within a short time. It's funny, because with this literally being on the edge of campus, the parking doesn't really bother me in that site plan. This parcel has always been Harrison-oriented, anyway, so I'm just fortunate they maintained that aspect of the redevelopment. I've been up and down this part of Harrison quite a few times in the past few months. I still can't get over how naked the area around Faculty Bricks and Cherry Lane feels and then couple it with the demolition of MSP and it feels more like an edge/frontier area of campus than ever before. So, it's good to see this being filled in with something more substantial than what was there before. Yeah, I only have a problem with it because of how easy it'd be to not have a parking lot there. What I really can't imagine is what they're going to do with the old Spartan Village property. That's a lot of land that I can't see a good use for.